One weekend, I was running out of ideas on what food to prepare, and just scanned through all the things we have on the kitchen. 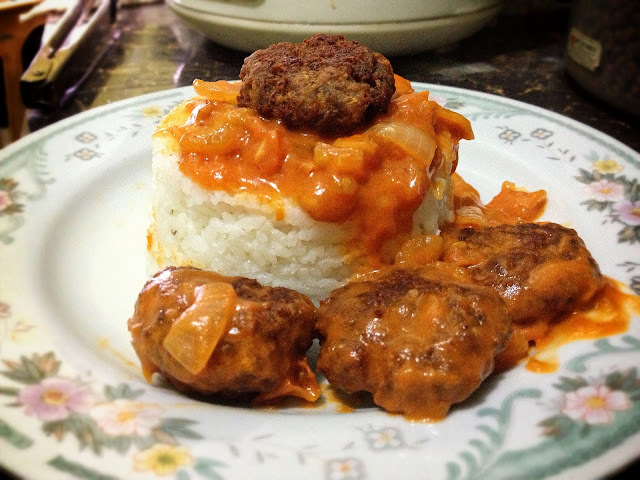 An idea popped into my mind and I decided to make meatballs with sauce. Here's my version. Saute onion and garlic in oil until golden. Add the chopped tomatoes, tomato sauce and water. Simmer over a medium-low heat for 20 minutes until it forms a thick sauce. Mix all the ingredients together in a large bowl and form into small balls about an inch thick. If you have time, cover and chill them in the fridge for 30 minutes. If not then cook them straight away but be warned – chilling makes them hold together better. Serve with sauce over rice or pasta. Carol is a petite girl with a big heart and big dreams. She is an enthusiastic foodie, fitness advocate and frustrated fashion and beauty blogger. Read through the pages of my adventures as I scrawl all of them on this blog. Be Carol is open to brand collaborations, product reviews, advertisements and sponsorships. For inquiries, please send an email at ranascarol@gmail.com. It's back! Papa John's Unlimited Pizza Day!